What Would the Night Sky Look Like If We Could See in All the Wavelengths at Once? There's a reason our eyes and brains only see so much. When responding to this question, I’m afraid I’m a little bit hindered by the human brain’s ability (or rather, its inability) to convert, process, and transform the information that it receives into images. The short answer: The universe would look like an extremely bewildering place. Unless your brain was altered so that it could interpret the new information that it was receiving, everything would be a confused and meaningless morass of color and brightness. In this case, it would probably be best to just keep your eyes closed (or maybe get fancy-fancy eye-patches). Gamma-rays have the highest energy and the shortest wavelength. Most often, they are associated with the hottest and most energetic objects in the universe: Massive celestial events like supernovae explosions or a feasting black hole. So if you could see gamma-rays, the night sky would be wholly unrecognizable. Look at the moon in gamma-ray, and you would only see a round and featureless blob. But of course, if you could see gamma-rays, on Earth, you wouldn’t be able to see any of the aforementioned things—not black holes, not supernovae, nada. To see these gamma-rays, you would need to leave our Pale Blue Dot. This is because Earth’s atmosphere blocks all incoming gamma-rays (which is why we need to go to space in order to do gamma-ray astronomy). But even assuming that you got to space, most of these objects are so far from the Earth that, assuming that you could see them at all, they would look like dim flashes in an otherwise dark cosmos (though you would see intermittent flashes from the sun as solar flares intermittently burst forth). But what about on Earth? If you could see gamma-rays, would you see anything as you wandered across the surface of this world? Yes: Radioactive material…which, honestly, would be rather nice (because you would always know where it was…and hence, where you should probably not be). To sum: If you could see gamma-rays, you’d see black holes and other super energetic events (if you were in space) and radioactive materials on Earth. Next, we have X-rays. Contrary to popular belief, if you could see X-rays, you would not be able to see through the neighbor-lady’s clothes (alas!). Well, you would. But you would just see bones. X-rays, which, like gamma rays, have rather high energy and very small wavelengths, can travel through clothes and skin, but they can’t travel through bone (which is precisely why doctors use X-rays to look for broken bones). Of course, this has a number of interesting implications. For starters, if you thought an X-ray was too bright, closing your eyes wouldn’t make it go away—it would travel right through your eyelid. There are a number of objects in space that emit X-rays: black holes, neutron stars, binary star systems, supernova remnants etc. However, thanks to Earth’s atmosphere, there is X-ray silence on the surface of the planet. So if you looked up at the night sky, you would see…nothing. However, you might be able to see something if you looked down at Earth: Sticky tape. That’s right. You would be able to see light when you peeled sticky tape, as this emits light in the x-ray part of the spectrum. Why does sticky tape produce X-rays? Well, we don’t really know. Generally speaking, X-rays are produced when an electron is shot at an atom and it’s deflected by the atom’s positive nucleus. In such instances, the motion of the electron (its kinetic energy) is converted into X-rays. And while we don’t exactly understand why sticky tape produces X-rays; we do know that it only works in a vacuum. More work is currently being done in this area, so hopefully we will have answers soon. To sum: If you saw X-rays, you’d see nothing, except if you were in outer space (or a vacuum on Earth, at which point you could see light via peeling sticky tape). If you could see the ultraviolet part of the spectrum, you would see a number of different objects. This is because our friendly sun gives off quite a bit of light at this frequency, so it would bathe the world in glow, much like it does not. Other cosmic objects also give off UV light, so we would still register other stars and the faint glow of the Milky way. Copiers, computer screens, and various kinds of other electronics (tanning beds) also give off UV light. So you would see these objects, along with the shadows they cast (nothing too spectacular or out of the ordinary, I am guessing). If you could see infrared light, you would see a world of temperature—not color. Any object that has a temperature radiates in the infrared part of the spectrum (even ice). 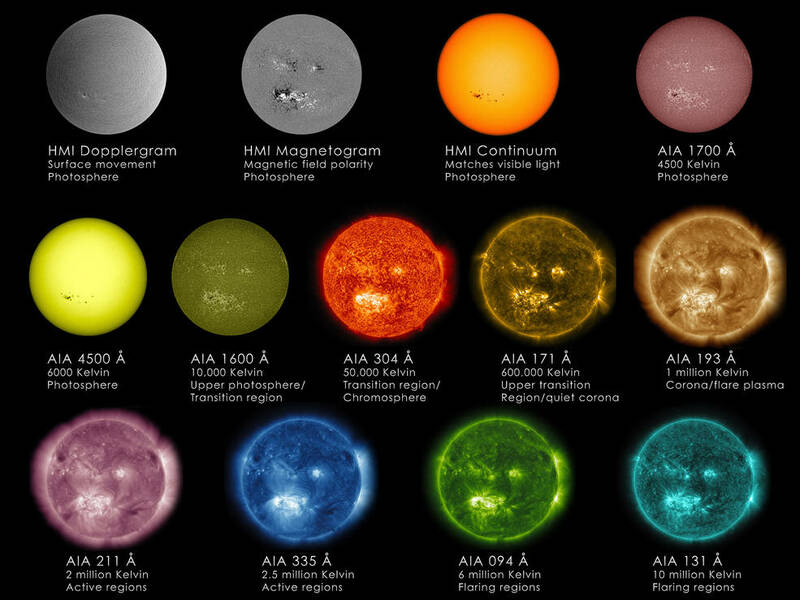 The hottest objects would appear brightest, so the sun will still be at the top of the list. You would see people and animals, and black pavement would be unbearable to look at on a sunny day; however, you wouldn’t really see specific features, only tones of heat. For example, a majority of the human face would be swathed in bright light, while the nose and fingers would be cooler and, thus, dimmer. Also, it would be very hard to sneak up on someone, as you would stand out against the much cooler surroundings. Run out side in the middle of winter, and you would be a streak of light. Now on to microwaves. Most of us have heard of the cosmic microwave background radiation that fills the entire universe, and which stands as a remnant of the birth of the cosmos—the great cataclysmic event that was the Big Bang. If we could actually see this microwave radiation, we would look to the sky and see light shooting at us (nearly) uniformly from every place in the sky (some of it is blocked by the atmosphere, but only a little). The universe would essentially be alight with brightness. Of course, stars also emit microwaves, so some spots would appear a bit brighter than others. Radio waves are what make your radio, global positioning system, and computer network operate. They are also used in broadcasting, communications satellites, and a host of other technologies. So basically, if you could see radio waves, anything that involves technology would light up like a Christmas tree. If we were to look at the sky, astronomical objects that have a changing magnetic field would light up. So we would see the Sun, the Earth, Jupiter etc. All the stars and black holes would dance across the sky, as they do now. However, Mars would vanish. The Red Planet has no magnetic field. Ultimately, if you could see all wavelengths simultaneously, there would be so much light bouncing about that you wouldn’t see anything. Or rather, you would see everything and nothing simultaneously. The excess of light would just leave everything in a senseless glow. Chances are, if this ability were suddenly switched on—if your brain underwent some miraculous metamorphosis and you could suddenly see all of the electromagnetic spectrum—you would go into shock and die. Your brain simply wouldn’t be able to interpret the information it was receiving. If you were lucky, you would instantly go blind. In any case, you certainly wouldn’t see anything like the pretty composite images produced by NASA’s Observatories (like the first one in this post). Ultimately, all of that light has been translated into the visible spectrum. It’s not what the light really looks like at all.